Faye constructed a block which was one hexagonal inside the other. The inner hexagon was twisted at 30&deg; and its points meet at the middle of the sides of the outer hexagon. A few variations on this theme were drafted, and this was the one she chose. It worked really well - photos coming soon! This set is the same pattern, but in two formats: a regular block, and p2psu. Hexagons are notoriously difficult to achieve accurate placement within - but one can readily see the edges of the hexagons - so p2psu works a treat. Please note: Intelliquilters do not currently recognise the p2psu format. 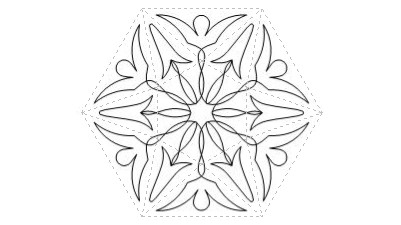 those with Statler Stichers can use the p2p function to accurately place and resize this digitized quilting pattern very quickly. Just 2 clicks and it's done! - resizing is done automatically - no need to calculate pattern height. registration points are shown with the *s in the illustration.